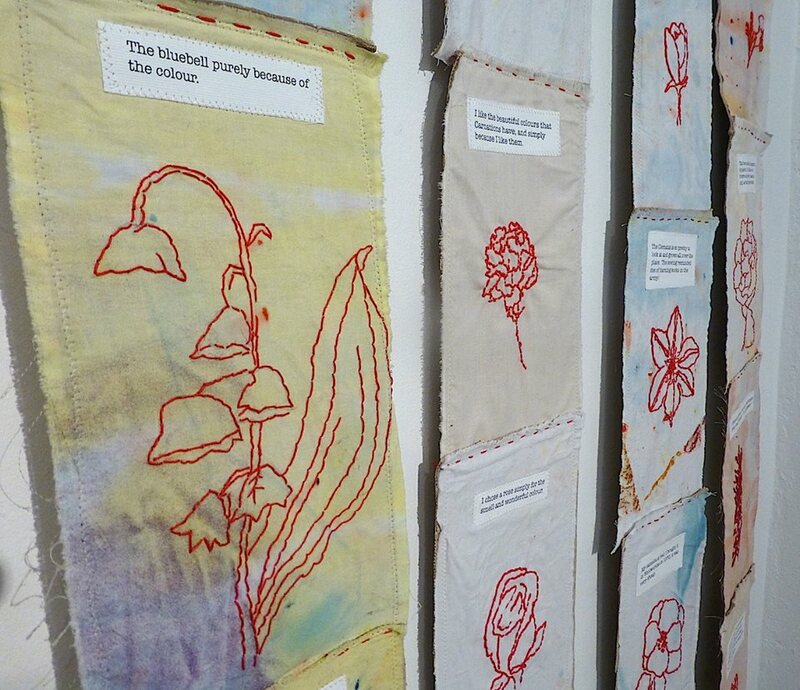 We are delighted that this year we have a textile artist in residence bringing a world of wonderful textile beauty to our garden room exhibition space. 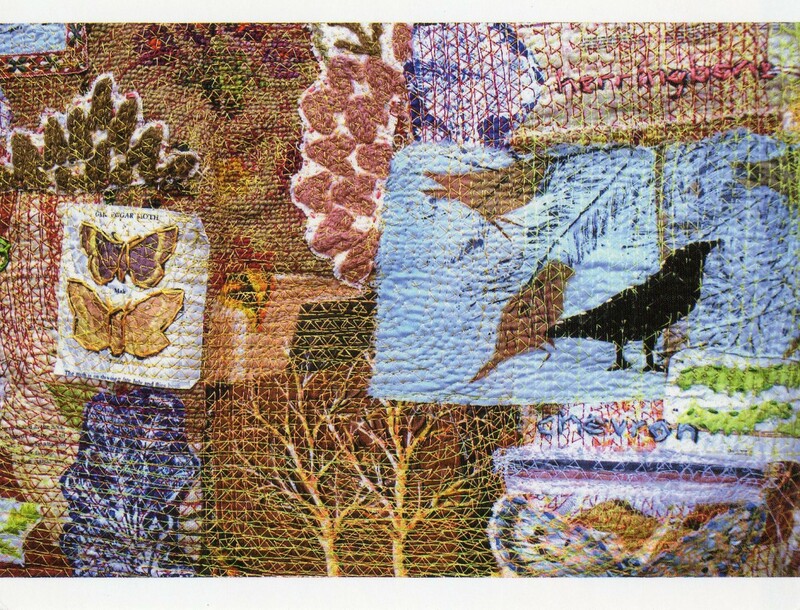 Anne has brought an amazing textile exhibition of her latest garden related work and is working on a wonderful collaborative wall piece called A Natural History of the Garden which is helping to raise funds for the RSPB Southeast. Anne will be coming to the garden regularly during the summer to work on the project and to lead drop in sessions of creative stitching on a garden theme with a range of glorious textiles. 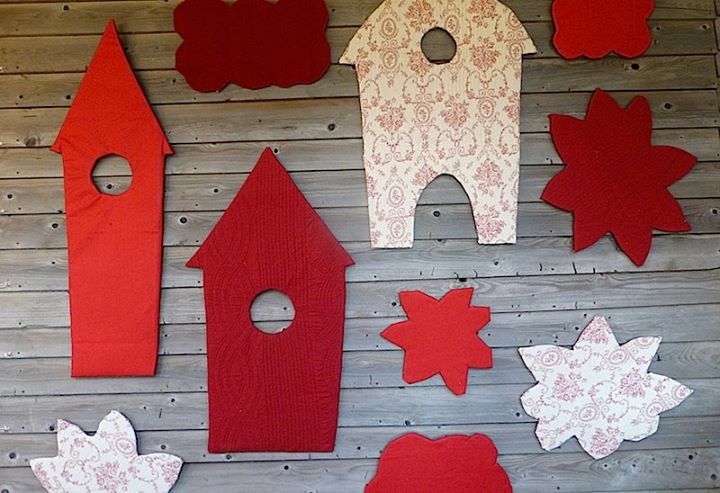 Why not come and try your hand at making a small piece for our wall..we have all the materials you need and even a whole load of inspiration from books and printed materials as well as the big garden of course. Take Anne’s easy step by step guide to creating your own piece. What better way to spend an afternoon sewing and chatting with friends over a piece of homemade cake and a cup of tea. 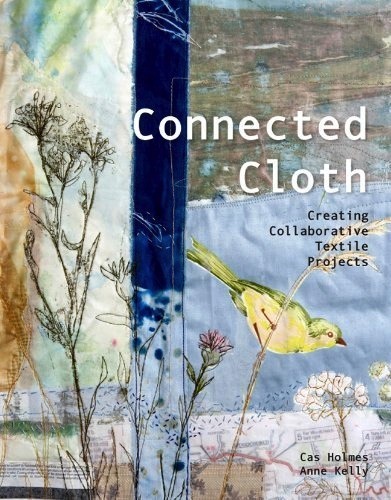 –Looking at the work of some contemporary poets, we will discuss ways to combine stitch and words in a special piece which you will start on the day and finish afterwards. You will create a unique record of your garden, one that you’ve visited or a special plant/flower that you like. Full day workshop. – combining paper and cloth extends your options when working in textiles. In this one-day course, tutor Anne Kelly will demonstrate some basic bonding techniques and help you to make a small folding book form celebrating a favourite green space. Surrounded by the lovely setting of the Prairie Gardens, we will use them as the basis to record plant and flower drawings and paintings on cloth. 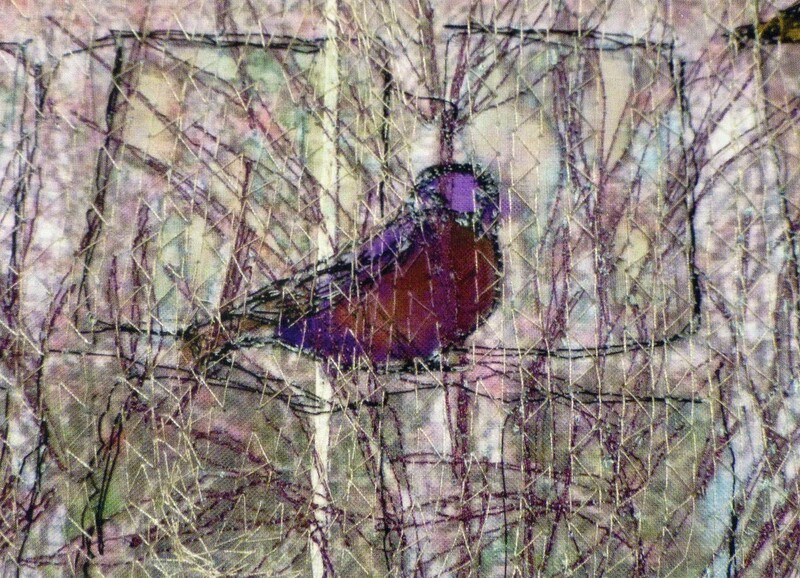 These will then be stitched using a variety of techniques and can be finished as solo pieces or incorporated into a larger piece. Full day workshop . 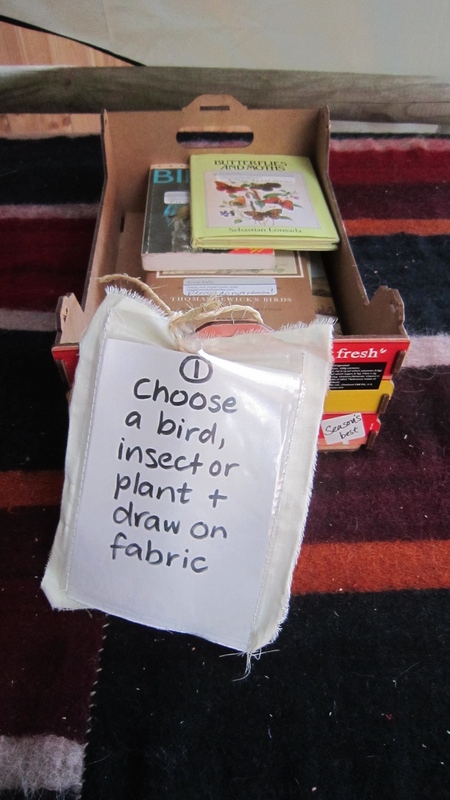 A joint parent and child course – using a variety of simple stitch and bonding techniques, create a unique record of your house and garden with a member of your family. 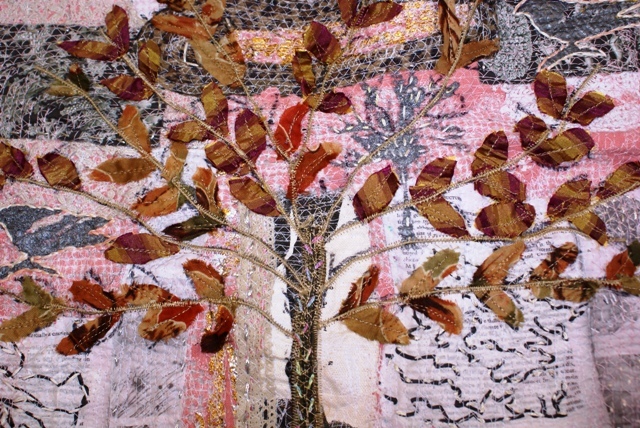 You will make the basis of this piece during the one-day workshop and can continue to embellish and add to it at home. Full day workshop . 2014 sees Sussex Prairies joining the Chelsea Fringe Brighton for a week of paper related happenings….we are now making our Little Paper House on the Prairie – a wheeled paper house and mini prairie garden which will be wheeled out into the garden for some prairie perambulations accompanied by the biggest garden gallery of outdoor paper artworks ever . for a whole week 31st may until 8th June 2014 Sussex Prairies will be celebrating all things papery , with paper related workshops and events. Weave with paper with Jackie Sweet ,make a paper kiln to fire prairie chickens with Sabine Dahn , design your own notebooks -Pages in Stages with Alison Crosthwaite and show the Egyptians how we really make paper with The Wolf and Jill Tattersall ! 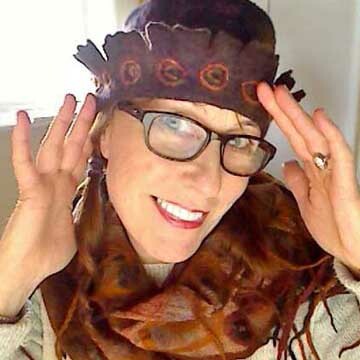 Our artist in Residence Anne Kelly , textile artist extraordinaire, will also be setting up her prairie wagon for a ho down of textile and paper delights too. 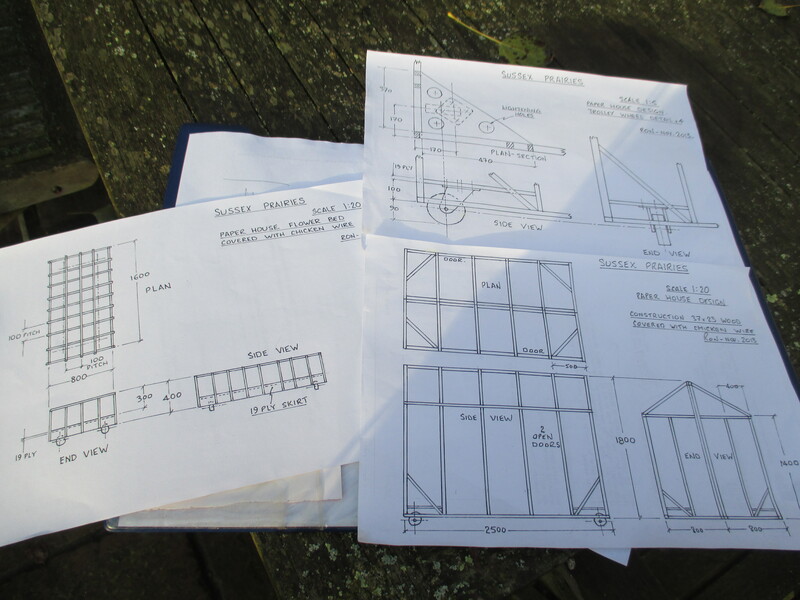 deep in the heart of Sussex our chief designer and wonderful volunteer , Ron, starts the tricky business of drawing up the plans for making the paper house. Working with a motley assortment of recycled wood and old window frames this talented architect prepares the blueprint for the architectural spectacle to come…. Joining the Outdoor Prairie Art Gallery : how to do it ? we are inviting everyone from the age of 0 to 106 to create artworks to accompany the paper house on its prairie garden travels. All you need to do is send us a picture of a house or home (could be a picture of a castle,igloo,tree house,tent, semi detached , bungalow,mud hut,cave etc ) on an A4 sheet of paper with your name, address and age on the back of it . We shall laminate your artwork, stick it on a garden label , and it will accompany the Paper House out in the wilds of the prairies for a week in wind,sun ,rain and shine. There will be Golden Prairie Family season tickets to win in the different age categories as well as art kits for the best artworks ! so let your imagination run wild. All artworks can be collected from Sussex Prairie garden after the 8th June, but sadly we cannot return them to you in the post.Remember, all pictures will be subject to all the elements so may not be in perfect condition after their adventure ! 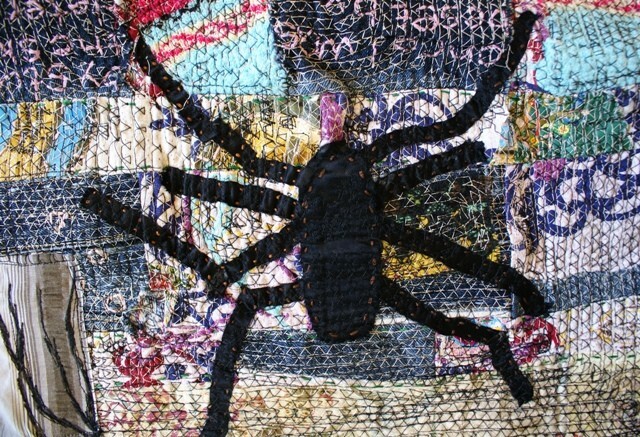 ” I trained as a fine artist in Canada and the UK and my work reflects these conventions by interpreting them in cloth. Many pieces are box framed and larger work and installation pieces hang without a frame. I also produce smaller pieces for private and public exhibitions and have work in the vatican collection. In 2013, I continue to collaborate with other artists and am exhibiting in the UK and abroad. I’m available for consultancy work and I am also happy to accept and advise on commissioned work. I have just completed a major public commission. This wonderful book is now out and on sale ! What will these workshops give me ? 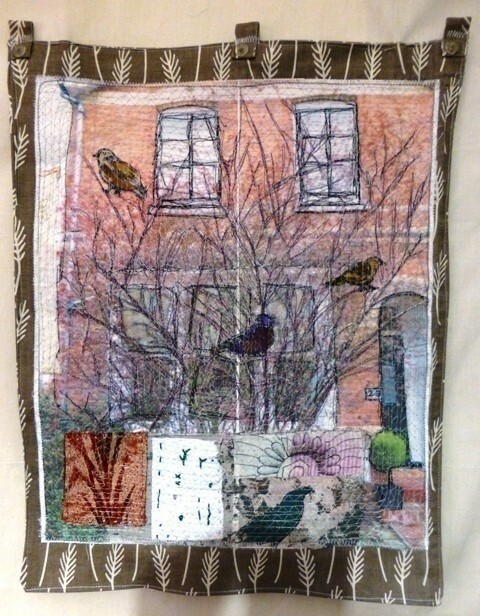 A chance to create a piece of garden/nature-inspired textile art in the inspiring surroundings of Sussex prairies gardens with Anne Kelly. All ages and abilities welcome. The cost fo the day will be £ 50 – you are welcome to bring a picnic lunch. you should bring materials and equipment for stitching including a sewing machine if you wish. 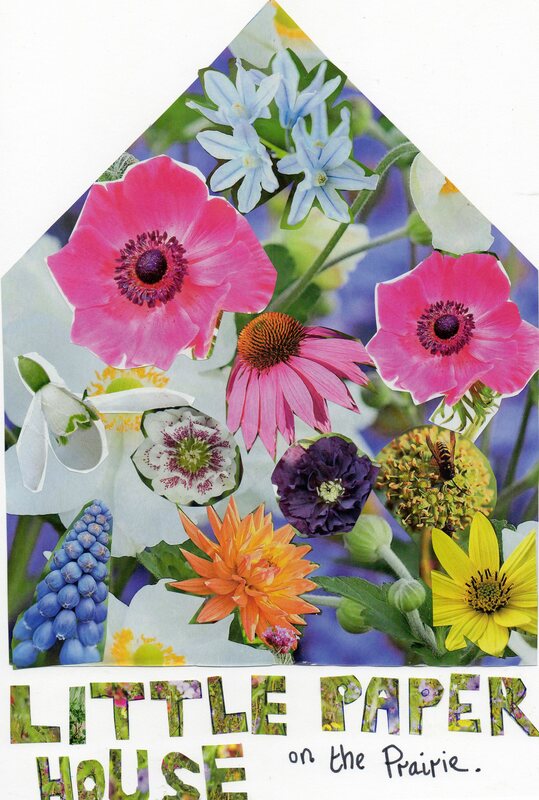 September 29, 2013: vintage/recycled garden –old and vintage fabrics enhance and give depth to many projects. 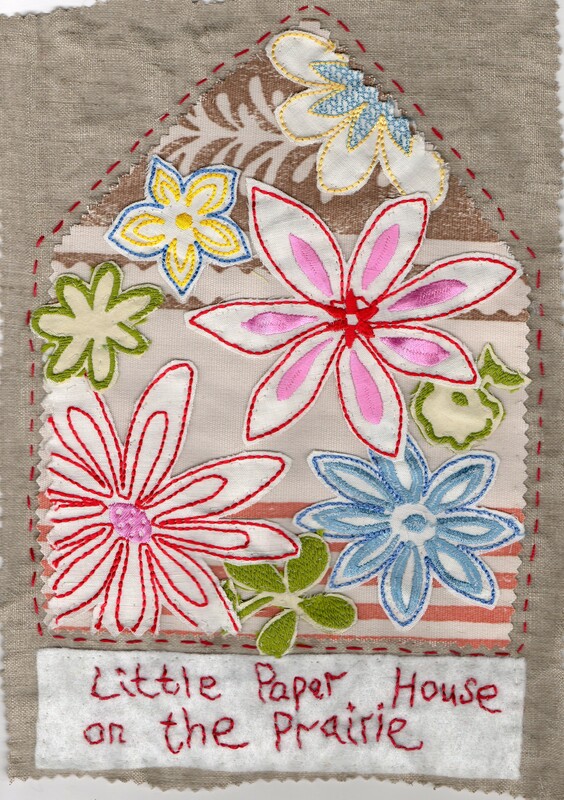 students will be asked to search through their collections for florals especially to applique onto a square sample. a mixture of couching and hand embroidery will be used to complete the work. The sample can then be made up into a cushion cover, tote bag or framed piece. materials list to follow. 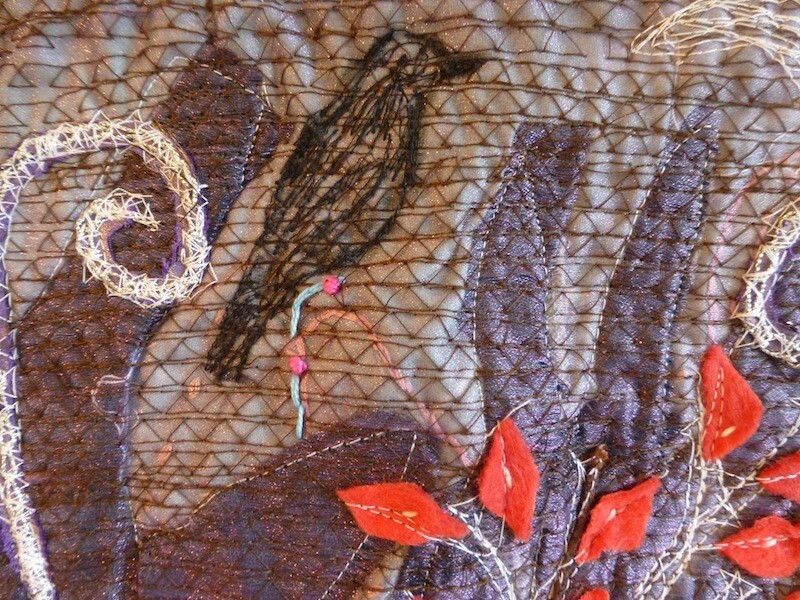 October 6, 2013: Birds – are everywhere in textile art at the moment – we will make a small bird stencil using a mixture of contemporary and vintage images as source material. this will then be printed onto various types of fabric and used in a range of samples. these can then be incorporated into larger pieces and embellished further by hand and machine. materials list to follow. 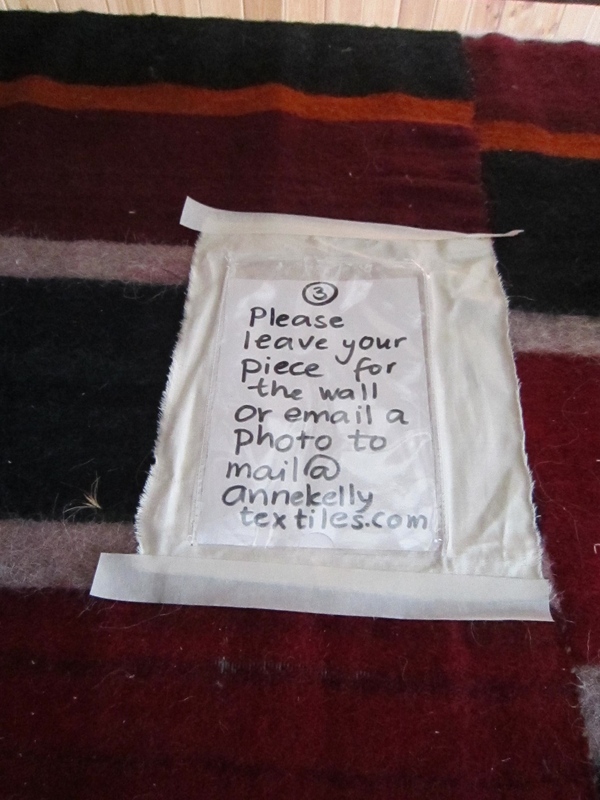 or contact her on mail@annekellytextiles.com to arrange payment using Paypal. With a summer of wool and sheep ahead of us we are delighted to welcome our newest artist to the fold : Mo Jackson :a felt maker extraordinaire ! She has been a graphic designer and illustrator for twenty five years but textiles have always been her first love. Now she is pleased to say she is leaving behind the computer and getting back to a more hands on approach to her creativity. Her life is now about designing and illustrating in wool! Feltmaking is a facinating process of taking unspun wool fibres, adding soap, water and elbow grease and making it into a non-woven material. It’s fun, therapeutic and totally addictive…I’m sure you’ll think so too. 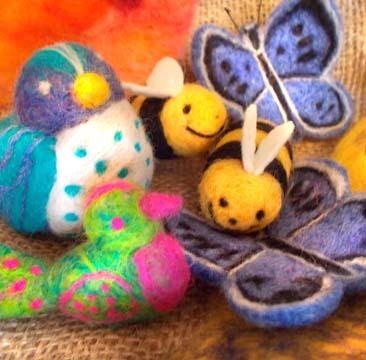 Needle felting is a dry felting process which involves no sewing, instead it uses a special needle with notches. By prodding the needle into the wool fibres this makes the fibres knit together, allowing you to make any shape you like… a kind of moulding in wool. In this workshop we will be making a variety of birds, bees and butterflies. It’s easy and fun, come and give it a go! In this workshop you will be bonding wool fibres onto a fabric base, this is called ‘nuno felting’. Wool fibres are laid down on the fabric in the design of your creation. Warm water and soap are added. The wool and fabric are rolled in bubble wrap and aggitated back and forth untill they fuse togerther. 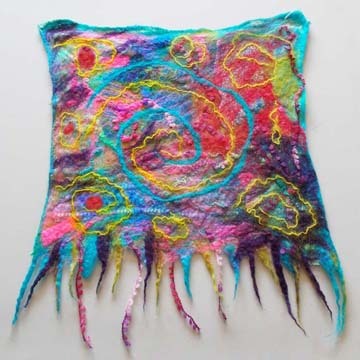 The end result is your own felted fabric art. Come and set YOUR woolly creativity free. 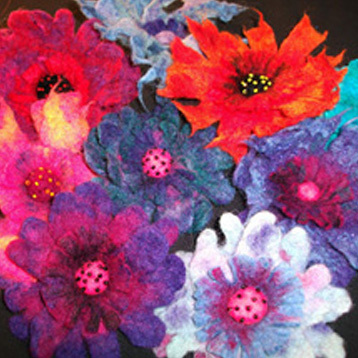 Felted flowers can be as varied as the real thing. You will be guided step-by-step though the ‘wet felting’ process. Wool fibres are massaged together with soap and warm water to form the felted flowers. Come and be inspired by the garden and make a corsage for yourself or as a gift for a friend…if you can bear to give them away! Felting around objects is fun and very therapeutic. The felted soap is good to use as an exfoliator in the bath. It also shrinks with the soap! Bring your own bars of soap if you prefer. 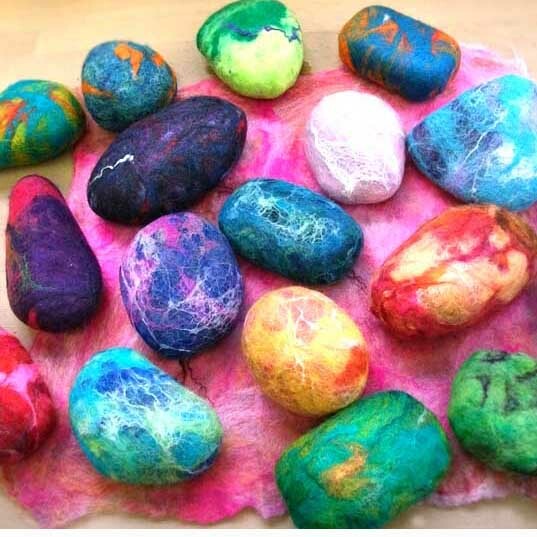 Felted pebbles are lovely tactile objects that can be used as paper weights or just to have as decoration on a table. Both are great to give as gifts. All materials provided. To book any of the above courses all you need to do is contact us and we shall send you a booking form. Each session costs £25.. Why not come with your friends and family and have a fun afternoon making beautiful things ! Jackie Sweet has been weaving willow here on the Prairie , but super sized ! 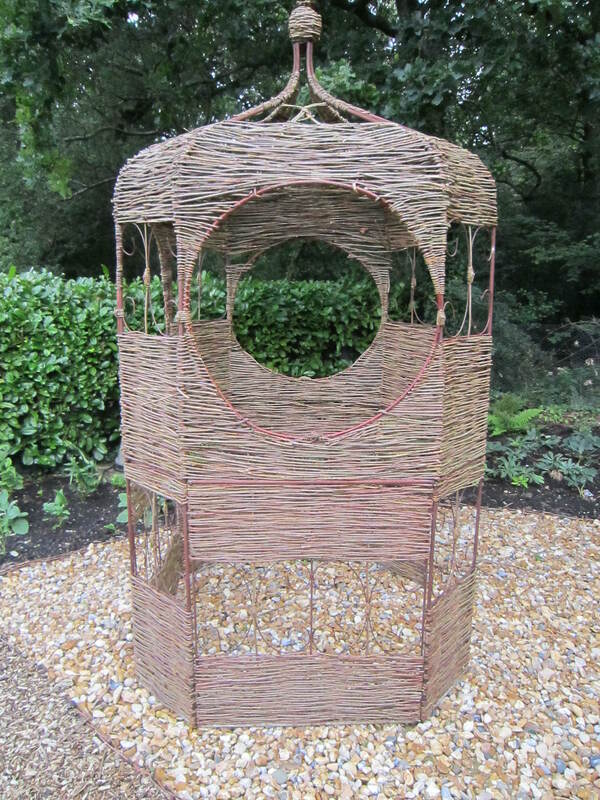 Taking our metal framed gazebo she has created a willow wonder which you can now see in pride of place in the Sven garden. So far it has been blown into the pig enclosure by the gazillion hour winds and finally returned back to its place again after a bit of additional weaving work done by the pigs .. not in a good way! They could certainly do with coming on Jackie’s Beautiful and Useful Garden Structures course. 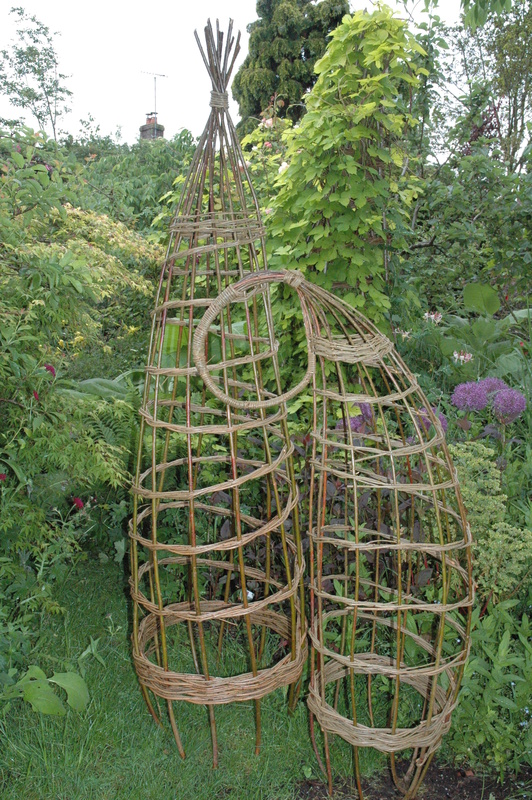 Jackie will be coming to Sussex Prairies for two ,one day courses making Useful and Beautiful Willow Garden Structures on 28th July and 13th October.Obelisks, trellises, fans and hurdles can all be used to both give support to plants and help make your garden even more beautiful. In a small group you will be able to learn how to make the very same. The only restriction being how big your car is to transport everything home with you ! No previous experience in necessary and all tools and materials will be provided. Cost £85 per person .Bring a picnic lunch with you to enjoy in the prairie garden and you are sorted ! Plenty of time available at the beginning and end of the course to enjoy the stunning landscape. 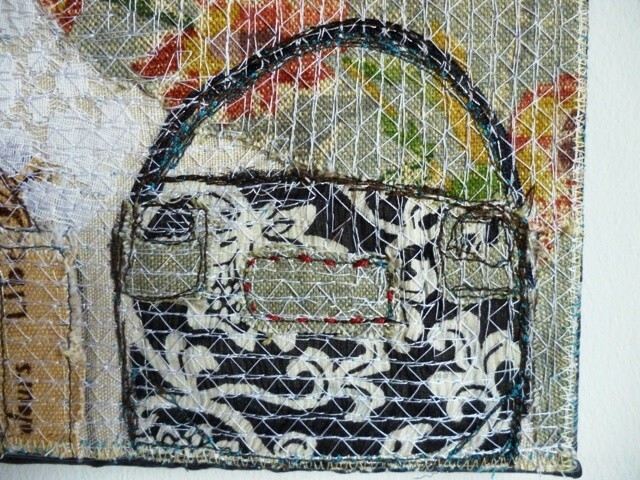 Jackie will also be exhibiting at our Unusual Plant and Art fair on sunday 2nd September 2012.Look out for her amazing apple picking baskets and picnic baskets ! We shall also be running a wonderful Christmas Willow Wreath and Willow Decoration course on Saturday 1st December 2012. Watch this space for more details. You can enjoy our special Swedish Saffron bread and gluhwein at this event ! Jackie makes, sells and accepts commissions for a wide range of traditional and contemporary baskets. 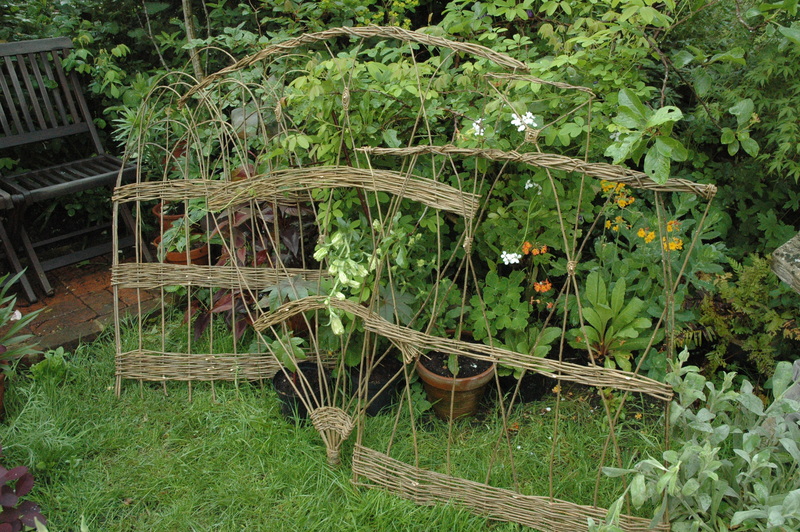 Also garden structures, including obelisks, plant supports, trellis screens, fences, hurdles using willow and hazel but also work with split wood, bark, hedgerow and recycled materials. Accepts commissions for basket repairs. 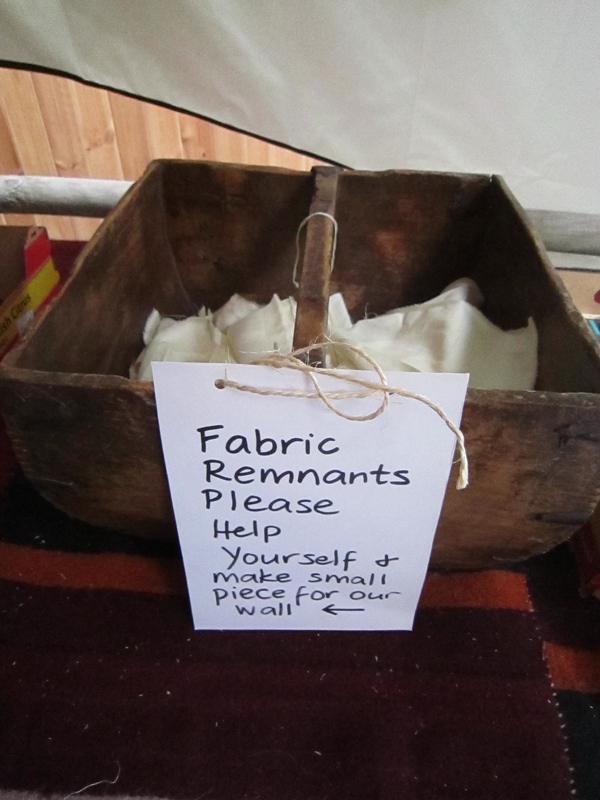 She also runs occasional workshops for children, beginners and intermediates in willow, hedgerow and recycled materials.